This software offers a solution for users who want to find and replace text in one or more files. The user can add files, entire folders or load a list of files from a file. There are buttons to allow removal of filenames containing or not containing user specified characters from the list. There are tabs to allow the user to enter a single text string to find and one for the replacement or multiple user specified sets for search and replace. The software includes sample files as an aid to new users. Once ready the user can search and replace even large batches of text strings with just one click. 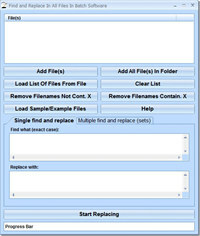 Find and Replace In All Files In Batch Software is an utility that works under windows xp, windows vista and windows 7. It supports both 32-bit & 64-bit windows editions, therefore it could run faster on 64-bit computers. Estimated download time for Find and Replace In All Files In Batch Software on a common adsl connection is less than a minute. 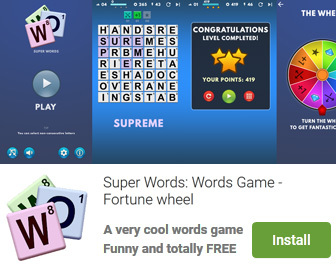 Version 7.0 was released three thousand fourteen days ago by Sobolsoft. Click the green download button to download it now.